About: Another day, another review of a small book with generous appeal. Sandra Forty’s seven pages of text get the party started. With such limited space, she tells the Austrian painter’s story well and with much-needed concision. There’s no room for depth, but she does what needs to be done and does it admirably. The star of the book is, of course, Schiele’s art. There are eighty-two chronologically arranged plates, each one contributing to the riveting aesthetic harmony of one of the most astonishing artistic outputs of the 20th century. The reproductions may be tiny, but they are stunning. Motivation: Egon Schiele is one of my favourite artists. I find inspiration from hundreds of sources: kooky, disparate, and not all word related. Art, photography, silent cinema, and fashion history all serve me well when, throwing off the shadows from my mind, I head out into the wider world in search of creative focus. 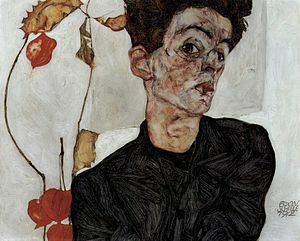 To learn more about the artist, and to see great examples of his work, head on over to the Egon Schiele Artsy page. This entry was posted in Project 366 and tagged Art, Biography, Book Reviews, Books, Egon Schiele, Painters, Painting, Reading, Reviews, Writers, Writing by maedez. Bookmark the permalink. He is such an interesting artist! Once, I was reading his book in NYC at a deli, and as I walked out of the deli, a building across the street burst into flames! It was on Lexington Ave. I will never forget it. He is, absolutely! I can stare at his work over and over and still be fascinated. That is an amazing story. No wonder you remember what book you were reading that day! My time in NYC did not result in anything that memorable.